Super hero situations require the play to apply Sonic’s speed to a useful purpose. (1) Speed devices: Devices that aid progression, which needed to be powered by Sonic’s speed. (2) Outrun obstacles: Obstacles that can only be overcome by outrunning them. Super Hero Situations create a meaningful purpose for Sonic’s speed. They add value to the speed and cause the player to respect it as a super power. A slower character would lack the speed needed to overcome the situation. Modern day games only contain situations where Sonic has to outrun obstacles. As a result, much of the unique identity of the series is lost. It’s no use being “the fastest thing alive”, if the speed is not utilised an interesting manner. 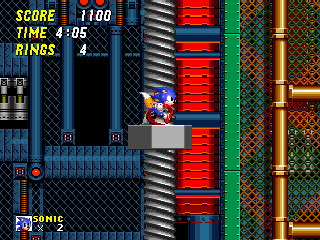 The classic games had a number of situations that required the player to make full use of Sonic’s speed. The situations allow Sonic’s speed to have a meaningful purpose. This causes the player to respect and value the speed as a super power. What are super hero situations? These are devices that are powered by Sonic’s speed. They usually aid progression. ▲ In this Sonic has to use his speed to turn the washer. This will allow him to travel upwards. These are obstacles that Sonic needs to be outrun. ▲ Here Sonic must run past this crusher before it strikes. Familiarity and innovation Devices that make use of Sonic’s speed are usually based around platforming clichés. This adds familiarity which enables the player to grasp the mechanics of the device. As the same time, the devices incorporate a unique Sonic twist which creates innovation and freshness. Identity Super hero situations are key technique for establishing the identity of the Sonic series, as they can not be overcome by a platform character that lacks speed (and/or the ability to roll into ball). Uniqueness In the classic games, each level contains a unique type of super hero situation. While the situation may be repeated through out the level, it does not appear in other levels. This prevents the situation from becoming repetitive and so allows each level to remain fresh. Some of the speed devices made a minor appearance in Sonic Adventure. However, they have been phased out in later games. Sonic Adventure is often regarded as being the ‘truest’ interpretation of the classic games and this authenticity could derive from the fact that it uses speed devices (which, as noted above, are key part of Sonic’s identity). 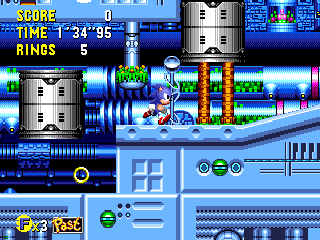 A small number of speed devices appeared in Sonic Advance 3. However, the tag character mechanic allowed the player to by-pass most of the devices, which rendered them useless. While outrun obstacles occur in the modern games, they are often implemented as dramatic scripted sections, which carry a number of disadvantages (examined in the dramatic scripted sections page). Super hero situations rarely appear in the modern games. Although the speed devices are often simplistic adding them will create a sense of freshness. The devices help to establish the identity of the Sonic series as they present a mechanic that can only be used by a fast character. [[module Rate]] Use the +/- buttons to rate this section.